Accomplishment is eluding me. Counting my blessings is my new mantra. I feel like a big baby being frustrated at things that are so temporary (kids with colds, having no energy, no time, projects that aren’t turning out, struggling to find balance) when I know that I truly have everything to be thankful for. So, I attempt to remind myself of that truth every day. Titus is nearing three years old and I still find myself with unrealistic expectations for what I can fit into my day as a mother. Instead of remaining in that necessary flexible state, seizing the easy moments as they come and being grateful to have done what I can in them, I give myself goals I know I can’t even begin to accomplish with two little kids who seem to be in constant need of my help. Inevitably, this leads to feeling resentful of them in those moments. You’d think I’d be good at sitting by and watching things that I just can’t quite get to pile up, but I have a hard time letting go of my control, my organized attempts. All untrue. I think that until I learn to keep correcting my soul, keep confronting my attitude head on, and recognize the fallacies behind my thoughts, I’ll go through my days with the vague impression that my life is hard. That I’m some kind of over worked, under-appreciated mommy victim. That the life I have isn’t the one I wanted. Really, I have to see it from another perspective: my kids are gifts, our health is a gift, my husband is a gift, my days are full of moments too sweet to capture. Like today. Outside: a freaky snow storm. 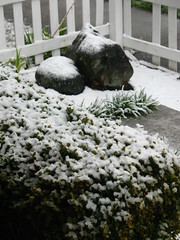 More snow than we’ve had all winter here. I got to teach Titus that God is making that snow for us. I really did get to do some sewing on my projects. 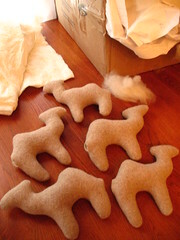 The secret one is nearly finished, the stuffed animals are coming along (with a few minor disasters). I’m thankful, I’m thankful, I’m thankful…. Edited to add: Nap Time Poop Finger Painting Extravaganza #6 was today. That’s two beds Titus has pretty much destroyed beyond use. He’s going to be sleeping on the floor for a long, long time. I always imagine you with so much balance and calm. It will get easier when they can play together. Now that Stella really PLAYS with Hannah (especially now that she’s out of her biting phase) I feel like life is about 10 times easier. Your family is still in our prayers! I’m always thankful for two cakes and beer too 😉 God rocks! I can’t remember either Pat or I painting with poop… He must really get into it if he is destroying the beds in the process.